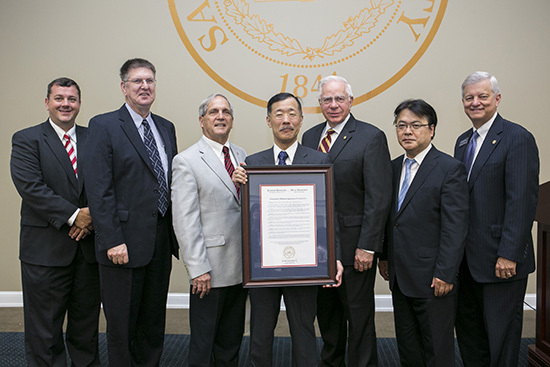 Representatives of Samford University's McWhorter School of Pharmacy and Meijo University School of Pharmacy in Nagoya, Japan, met at Samford Thursday, July 10, to celebrate 20 years of what all agree has been a highly successful exchange program. "It has been something pretty amazing," said MSOP pharmacy practice department chair Michael D. Hogue. The initial idea, Hogue said, was for graduate level clinical pharmacy students at Mejio to visit Samford for a summer program that would introduce them to American clinical pharmacy practices and academics. "It is what we envisioned it to be," said Joseph O. Dean, who was MSOP pharmacy dean when the relationship began in 1994. About 10 Samford pharmacy faculty have traveled to Nagoya and other cities in Japan to participate in conferences of pharmacy educators, lecture in classrooms and absorb Japanese culture. Samford pharmacy students have studied at Meijo, where they made case presentations and gained clinical experience at local hospitals.